Needlepoint eggs are great projects for indulging your creative instincts; and they make excellent gifts for family and friends as well. These two needlepoint egg designs offer something for every stitching level. Beginners can use the patterns to show off newly acquired skills at working more intricate stitch techniques; and experienced stitchers can indulge in some serious idea generation for new needlepoint stitch combinations and thread choices. Turn plain flat egg embroidery patterns into decorative and elaborate needlepoint ones that will be admired all through the year. It’s quite easy to change the needlepoint chart colors to ones you adore. Just pull out your color wheel and experiment a little with different tints, hues and schemes based on colors you have on hand in your thread stash. Both needlepoint designs are ideal for using up scrap threads and 13-mesh mono needlepoint canvas. The finished needlework can be made into ornaments, gently stuffed toys and needlepoint stand-up figures. Bright yellow with red, blue and green accents attract attention to this elegant needlepoint egg. With a finished design area that’s a little over 3 inches wide and 4 inches high, the needlepoint egg pattern is quick to work for last minute gift-giving. A few rich looking textured needlepoint stitches would be very effective for working the background; and the needlepoint couching technique could be used to overlay threads for stitching the elegant filigree design. When working straight stitch patterns such as Encroaching Gobelin, remember to use enough strands of fiber to adequately cover the canvas. Download and save a copy of the free Elegant Golden Egg Needlepoint Design. You can make as many copies as you need to share and use when stitching the detailed parts of the filigree design. Check out this neat idea for a needlepoint project. Soft pastel blue overdyed stranded cotton or silk threads worked in a subtle gradient effect would create a charming picture for the background of this delicate needlepoint egg project. No matter the color scheme, have some fun working the project for a special occasion or holiday. For a spectacular Faberge style needlepoint egg, work an outline of the shape first with overdyed threads in simple Hungarian, brick or Mosaic stitch patterns; and then, couch metallic braid for the curlicues. Complete the jeweled effect with embellishments of faux gems, charms or tiny seed beads. You can’t go wrong experimenting with new and interesting ways to work basic needlepoint stitches in this project. Use stitch combinations or change thread textures by working alternating fibers like wool and cotton. Change the direction of the stitches and work the entire needlepoint project in a single color to take advantage of light reflection and the way it can adjust the look and feel of the needlepoint design. Sometimes, a few satin needlepoint stitches may be suitable for filling in the area between various parts of the filigree design; but care should be taken to keep the surface smooth. Although charted for 13-mesh mono needlepoint canvas with a finished design size that’s 3.5 inches by 4.71 inches, you could use 18-mesh canvas which would reduce the size to 2.7 inches by 3.7 inches. 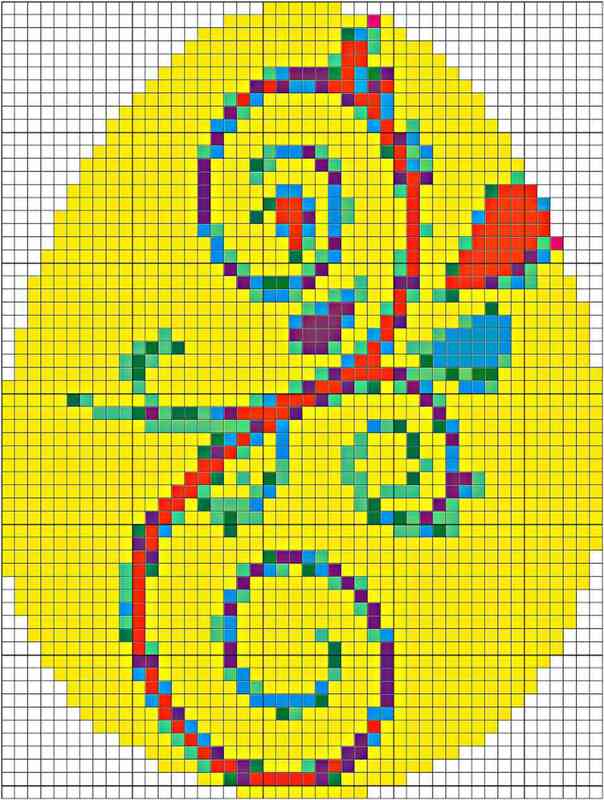 Get the full size Fabulous Blue Needlepoint Egg Chart to work the project right away. Beginners should consider this pattern as a chance to learn and practice needlepoint. Its simple design and delicate coloring make it a very easy needlepoint project to quickly finish and use.